Two of nature's most adorable residents came together recently — and engaged in an enchanting playdate. 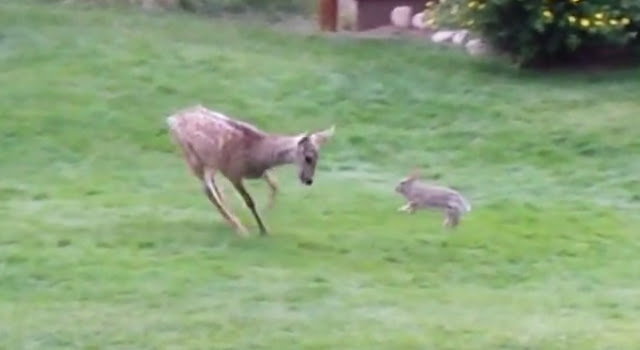 A recent video taken at Colorado's YMCA of the Rockies shows an unusual reaction between a fawn and a wild rabbit. The young deer curiously approaches the little rabbit, sniffing him then jumping back playfully. The rabbit, in turn, makes a little leap of his own. What follows is several minutes of curious nuzzling and incredible bouncy playfulness. Both the deer and the rabbit — who also appears to be a juvenile — leap into the air and bounce across the lawn, zooming back and forth as they get to know each other. While the little deer is certainly having fun, the rabbit looks rather annoyed and appears to be acting defensively — but he's curious enough to stand his ground instead of running away. In any case, the result is pure magic. Courtesy of Vicky and Steve Johnsen! Responses to "Curious Baby Deer Meets His First Rabbit, Invents Cutest Game"